Quentin Hanich leads the Fisheries Governance Research Program at the Australian National Centre for Ocean Resources and Security (ANCORS), University of Wollongong and consults for various international organisations and national governments on fisheries governance and marine conservation in the Pacific islands region. He has a strong research and consulting background, and a substantial track record in winning research grants and tenders for commercial research projects. He has extensive project management experience in fisheries governance, marine conservation, and fisheries management and development, and has worked widely throughout the Asia Pacific region. 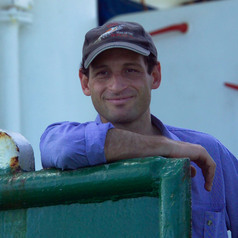 He is recognized as a regional expert on international fisheries governance and development, and more broadly on various aspects of oceans governance and marine conservation. In addition to his research and project activities, he has chaired international working groups at treaty meetings, facilitated inter-governmental workshops, advised Ministerial meetings and national delegations, and is a member of the Pacific Marine Sector Working Group and the IUCN World Commission on Protected Areas. He also lectures and writes on oceans governance, international fisheries, marine conservation, and fisheries development in the Asia Pacific region.